Latisse® bimatoprost ophthalmic solution (0.03%) is a prescription treatment for hypotrichosis, the condition of having not enough or too-thin eyelashes. Latisse® is used to encourage eyelash growth, making them longer, thicker, and fuller. Latisse® is a drug, and you will need to book a consultation with the doctor to see if you are a candidate to use the product. Latisse® is a once–daily treatment. Apply to the base of your upper eyelashes with a sterile, single-use applicator for each eye. The disposable applicators help ensure clean, healthy lashes and eyes. You will see visible results in as quickly as eight weeks, with full, dramatic effects in 12 to 16 weeks. One word of warning though: if your natural eye color is light, Latisse may stimulate it to darken, so do not commense the use of this medication without a medical consultation. 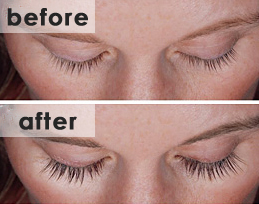 Eyelash length increased by 25 percent.